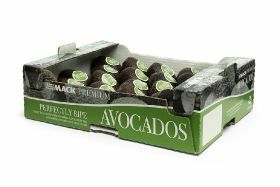 Avocados will now join bananas in the range, which it is hoped will be taken up a level by the new man in charge of Mack Wholesale Ltd.
Mack is celebrating a decade of successful years for its Mack Premium brand with a fresh design and new product launch. Mack Premium bananas have now been a familiar product on the wholesale scene for a decade, and they will now be joined by an avocado range. And stylish new boxes are designed to stand out from the crowd. A Mack spokesperson told FPJ that a loyal customer base in the wholesale markets has helped the sales desk at Mack International build volumes to the point where Mack Premium now outsells almost all other brands – with volumes set to grow much further in 2016 thanks to a renewed focus on the brand and to greater investment in marketing support. Steer the company into the next decade of trade will be Charles Rees, the new man at the helm of Mack Wholesale. He joins the Fresca Group company from his previous role as managing director at Vitacress Sales, a company with whom he spent 21 years. Previous Post LinkChicken tikka sandwiches recalledNext Post LinkFresh Produce…Really?